We’ve mentioned the Geffrye Museum gardens before but they’re well worth a more detailed mention. There are two distinct gardens at the Geffrye – the first are the public gardens located just off Kingsland Road which were originally laid out when the almshouses in which the museum is now based were constructed while the second is the walled herb garden and series of period garden ‘rooms’ which are much more recent additions. While origins of the former date back to when the almshouses – 14 homes of four rooms each with a central chapel – were built in 1712-14 by the Ironmonger’s Company under instructions in the will of Sir Robert Geffrye (for more on him, see our earlier Famous Londoners entry here), they weren’t opened to the public until 1912 when the London County Council took over the site (for more on the history of the almshouses, see our earlier entries here and here). These gardens originally featured a series of lime trees and by the early 19th century, an image shows lawns surrounded by railings with some flower beds and trees. The front lawns were apparently grazed by sheep or employed for growing crops of potatoes. By the mid-1800s, the lime trees had been replaced by London plane trees, most of which are still standing. The gardens were again laid out in 1900-01 and again after the LCC took over in 1910 when a small pool was added in front of the chapel and a bandstand and playground elsewhere in the gardens. 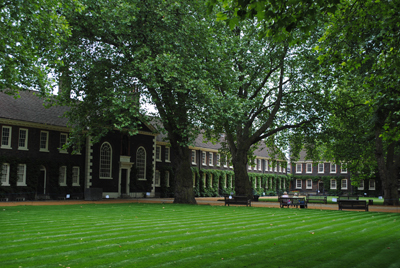 The grounds also include a small graveyard – that of the Ironmongers’ – and among those buried here are Geffrye and his wife, their remains brought here from the chapel of St Dionis Backchurch in Lime Street when it was demolished in 1878. The walled herb garden and period garden ‘rooms’, meanwhile, were added in the 1990s. 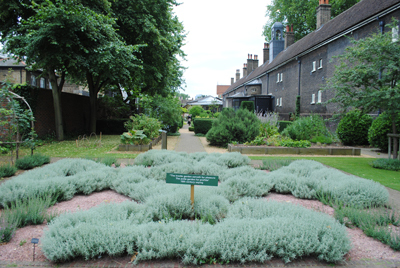 The herb garden opened in 1992 on a what had been a derelict site to the north of the building – it features four square beds containing more than 170 different herbs and plants. The period garden ‘rooms’, meanwhile, were laid out in 1998 to showcase middle class town gardens from different eras. They currently include a Tudor “knot garden”, a Georgian garden, a Victorian garden and an Edwardian garden. Each of these gardens has been carefully constructed using evidence gathered from drawings and prints, maps and garden plans along with plant lists, diaries and literature. WHERE: Geffrye Museum, 136 Kingsland Road, Shoreditch (nearest tube station is Old Street; nearest Overground station is Hoxton); WHEN: 10am to 5pm, Tuesday to Sunday (front gardens are open all year round by period and herb gardens are only open until 1st November and reopen on 28th March; COST: Entry is free; WEBSITE: www.geffrye-museum.org.uk/explore-the-geffrye/explore-gardens/. • Christmas is looming and at the Geffrye Museum in Hoxton that means the museum’s many period rooms have been transformed for the Christmas festivities. The rooms span 400 years of history, from 1600 until today, and show how the middle class have lived over that time. The Christmas display will also provide insights into such Christmas traditions as kissing under the mistletoe, hanging up stockings, sending Christmas cards and decorating trees. The Christmas theme carries through to the restaurant and gift shop. Entry to the exhibition is free. Runs until 6th January. For an online gallery showing some of the rooms, click here. For more on the museum, see www.geffrye-museum.org.uk. • Meanwhile Kensington Palace is to be transformed into giant advent calendar in the lead-up to Christmas with a daily ‘reveal’ inspired by Princess Victoria’s Christmas diary entries and letters. The halls of the palace will be decorated with 24 specially designed mirrored baubles, Christmas music will be played throughout and a sparkling 25 foot high Christmas tree will be placed in the gardens. As part of the Christmas festivities, an evening of carol singing will be held on 5th December in the King’s Gallery with carols sung by the Hampton Court Palace Royal Chapel Choir. Other events include a Midwinter Masquerade Ball on 13th December and an Eerie Evening Tour on 20th December. For more, see www.hrp.org.uk/KensingtonPalace/. • A new permanent furniture gallery opens at the V&A this Saturday. The Dr Susan Weber Gallery – the first at the museum dedicated to furniture – will display more than 200 pieces of British and European furniture, spanning a period stretching from the Middle Ages through to present day, as well as examples of American and Asian furniture. Each piece is examined in detail with information provided about the materials and techniques used in creating it. Among the designers represented will be Thomas Chippendale, Grinling Gibbons, Robert Adam, Ron Arad and Tom Dixon. Highlights include a 20th century Frank Lloyd Wright-designed dining chair, a gilded cassone made for the Duke of Urbino in about 1509, and a scagliola decorated table which was formerly at Warwick Castle and dates from 1675. Twenty-five ‘key’ pieces have been selected for a central chronological display including a storage unit by Charles and Ray Eames dating from 1949-50, a Gothic revival cradle dating from 1861 and designed by Richard Norman Shaw and one of the museum’s newest acquisitions, the 2011 ‘Branca’ chair, designed by Industrial Facility. The display includes the use of touch screen interfaces, films and audio recordings. Entry is free. For more, see www.vam.ac.uk. • On Now: Bronze. Last chance to see this exhibition at the Royal Academy of Arts which closes on 9th December. The exhibition brings together more than 150 of the finest bronzes in the world, spanning 5000 years of history, with many of the pieces on display never seen before in the UK. Among the earliest works are the 14th century BC bronze and gold Chariot of the Sun from Denmark, ancient Chinese ritual vessels including an elephant-shaped vessel dating from the Shang Dynasty (1100-1050 BC) and an Etruscan masterpiece – Chimera of Arezzo, dating from about 400 BC. Other highlights include a Roman cavalry helmet found in Cumbria in 2010 and the Portrait of King Seuthes III, dating from the early Hellenistic period, and found in Bulgaria in 2004 as well as a series of Renaissance bronzes and more recent works like Rodin’s The Age of Bronze (c 1876). Admission charge applies. For more, see www.royalacademy.org.uk. Tradition holds that this small triangular area, wedged between Westminster and Chelsea on the north bank of the Thames, takes its name from Ben Pimlico, said to be the 17th century owner of an famous alehouse or tea garden in Hoxton, on the north side of the City, and brewer of a particularly sought-after “nut brown” ale. The story goes that so popular was his brew that Hoxton Street was then known as the “Pimlico Path” due to the numbers making their way to his alehouse and that the area of Pimlico somehow adopted this name (although to be fair we should note that it’s also been suggested that the name comes from the Pamlico tribe of American Indians who exported timber to London around the same period). 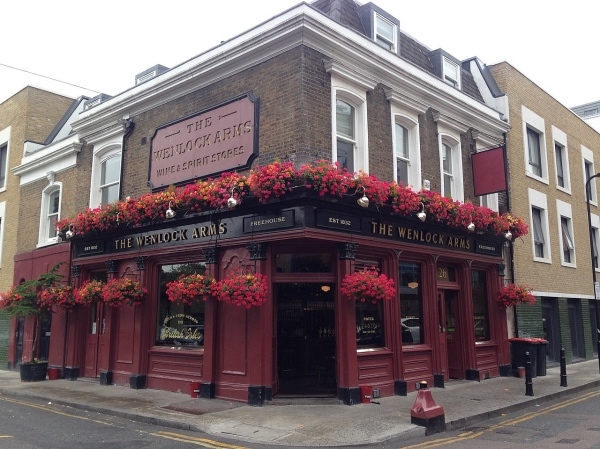 While references to Pimlico go back to the 17th century, the area was largely uninhabited until the 19th century when it was developed by Victorian planner Thomas Cubitt under contract to the land owner, the Grosvenor family. Initially in demand among the well-to-do, the fortunes of the area had declined by the end of the nineteenth century before a resurgence of interest took place in the early 20th century. Among the projects constructed at that time was Dolphin Square (pictured) – with more than 1,200 apartments, it was the largest apartment complex in Europe at the time and has since proved particularly popular among politicians keen to be close to the action in Westminster and Whitehall. 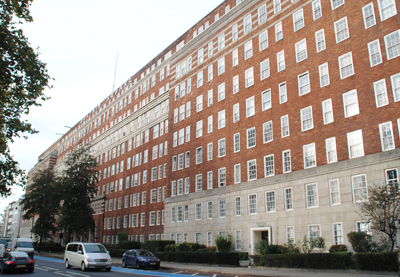 Famous residents of Pimlico have included Winston Churchill, who lived briefly at 33 Eccleston Square between 1908-11. Worth noting is that there is a racecourse in Maryland in the US known as the Pimlico Race Course which is also named for Ben Pimlico’s tavern. For a photographic essay of Pimlico, check out Brian Girling’s Pimlico Through Time .